High-end computers that render amazing 3-dimensional images.... super sized computer displays with multiple monitors... sophisticated analysis software... project websites. Of course, modern technology is essential to efficient and accurate creation of designs and management of the construction documentation. However, none of this matters if it isn't applied correctly. People design buildings and work with and manage other people to get the design and construction accomplished. At BJG our staff is familiar with the issues of both architecture and structure. It's not that any one person can do it all but that as a team within one office the coordination necessary for a project is faster and each specialty has insights into the other's issues. The result is a better design from the beginning. The senior designers at BJG, Jim Wallis, Cliff Johnson and George Ghusn, have the requisite amount of gray hair (some more than others) from years of experience in their fields. They also have a established an environment where creative but disciplined designs are routine. We believe that the junior staff members thrive in this environment and are able to be better and more “well-rounded” designers. Service is what helps differentiate BJG from other design firms. We understand that your design is important to you and it needs to get done on time and within budget. Communication is critical as well - things do not always goes as planned but the misses are more tolerable if you can see them coming. Too often in the design world, the problems are hidden until the deadline is past and then absolutely no one is happy. Another issue often encountered is slow response to contractor questions and submittals. At BJG we consider ourselves to be part of the construction team - helping the process. It does not help anyone if we delay the project by holding up the review and shop drawing process. We are on your side to help you get your project done. Knowing that time is money - and that problems only get bigger the longer they fester - is one of our keys to success. The poster above is in our office and describes for everyone what we consider to be good service for response times for various tasks that are a part of nearly everything we do. The fancy definition of BIM or Building Information Modeling, is that an building can be modeled as a database of items with each object having many properties (spacial, structural, electrical, etc.) and relationships between all the objects, such as dependencies (beams hold up joists, for example) and intersections. Much hype has vomited out of various sources and has often lead to unrealistic expectations as the the level of development in the actual software and the usefulness of the various programs. Ideally, BIM would live up to all the hype. As we all know, this is not an ideal world. BIM is a tool. It’s a great tool. However, the sad fact remains that if you are an idiot and use BIM , you’ll still be an idiot. From a practical standpoint, BIM today is represented by programs that allow designers to work with building objects rather than lines that represent them. An object like a wall, for example, is represented in ordinary CAD by two parallel lines. In CAD, it’s just two lines. 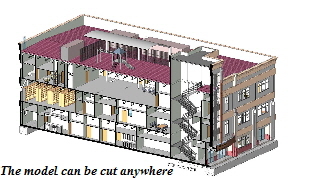 In Revit, Autodesk’s BIM program, a wall is a wall. On a plan view it’s just two lines. But quickly flip to a 3D view and your wall has height and thickness. In CAD, adding a door to the wall on a floor plan requires a series of editing and addition operations to cut the lines and get the door symbol in place. But it only exists as lines on a plan - By contrast in Revit, adding a door cuts the wall that hosts it and shows up in all views - elevations, 3d views, etc. The obvious advantages are elevations, plans and sections that are always coordinated because they are just views of a 3d group of objects in the database. Other advantages are the ability to use the drawing or production model of the building as the analytical model. This aspect is not as simple as it sounds. In structural engineering, for example, we model the structure differently than the drawings show the construction. How? Beams are beams, that's relatively straightforward. But some walls and floors have lateral force functions that may be modeled different ways depending on the type of construction, the geometry and the engineer's opinions. As computer capacity increases and programs become more sophisticated, BIM may live up to the hype as a design, analytical, construction and maintenance solution for a structure's entire life. But we’re not quite there yet. BJG uses BIM for all design work. Not just when we want to impress the neighbors. BJG started using Revit, Autodesk’s BIM program, back in 2006. At the time, we were at a crossroads of sorts regarding standard details and automation of production drawings. We had experimented with “sheet sets”, a standard AutoCAD drawing set coordination extension. But sheet set wasn't really enough - we didn't feel we were leveraging the investment in computer hardware to it’s best potential. Our Autodesk sales company prepared a presentation of AutoCAD “Architectural Desktop”, essentially sheet set on steroids with lots of standard blocks. They also showed us Revit, a Building Information Modeling (BIM) program. Although it would have been an easier transition to Architectural Desktop, we made the decision to jump in Revit, at least in part because we were assured it was the future. It was not clear at first that this was the best idea. We had in house training for a week. The training showed the basic operation of the program. I still remember the thrill of drawing a joist from one spot to another and seeing the chords and web members to (approximate) scale in a 3-D view*. But the devil is in the details... and the early versions of Revit had some definite limits. The biggest problem is not the program but changing the entire method of approaching production documents. There are six well-defined phases of Revit usage see here. The major hurdle to using Revit (or likely any BIM program) is that you need to think about the objects in a building while you are drawing in more detail than usual to get the most out of the program. This is mostly a problem for the experienced “line drafter” (AutoCAD). Because Revit is totally different to draw a model, CAD persons have a big conceptual hurdle to overcome. And NONE of the commands are the same. People coming to computer design for the first time do not have this issue but the complexity of the program causes heartburn. Once you feel at least somewhat in control of the program, Revit is the best tool ever for design of a building or structure. Mechanical items, not so much. 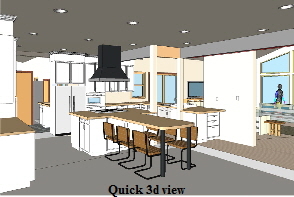 Revit 2013 and on has decent MEP tools but still that’s a work in progress. * I’m an engineer, enough said. In and of itself, BIM does not improve design. Rather, it gives designers and others better visualization of the design which can identify problems before they get to to the field. The term “clash detection” is used to identify where building systems try to occupy the same physical space (this is bad). Such detection is key to avoiding much bigger problems in the field. Visualization helps everyone. In one project where we were designing the interior of a large club, the bar layout was critical for plumbing layout and functionality. We are pretty good designers, but lousy bartenders. To layout the bar, a representation of each component of the bar equipment was created. 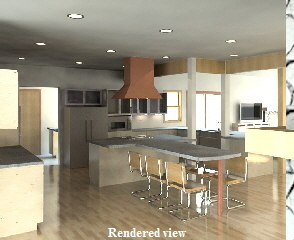 Then, using a large screen and 3d views, we coordinated the layout with owner who was an expert bartender. The real beauty of this procedure was the speed in which we could re-arrange the equipment and the fact the layout was in the final model when we were done. Efficient. We often use this ability to show clients what their projects will look like from the inside while standing in a particular area. These illustration class views are not real renderings, but are detailed enough to allow clear understanding of the spacial relationships. Because Revit is basically a database of building pieces, one can query the database for quantities. This can be used to prepared preliminary cost estimates that are fairly accurate. The section above shows new construction over existing construction. Careful modeling of the existing structure allowed the design of the cantilever structure to work.